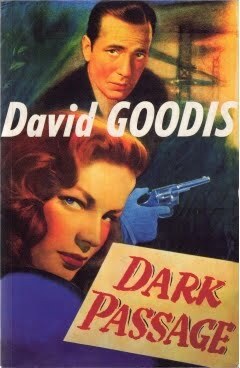 Dark Passage, published in 1946, was the first novel by David Goodis. The following year it was made into a Bogart/Bacall movie and Goodis landed himself a screen-writing contract in Hollywood. He seemed to have a bright future opening up, but as in the case of so many of the heroes of noir fiction, it was not to be. He did go on to write quite a few more novels before his untimely death in 1967 as the age of 50. Dark Passage is a little in the style of James M. Cain’s The Postman Always Rings Twice, with a confessional style of narrative. There’s even more emphasis in Dark Passage on lengthy interior monologues – at times it almost approaches a steam-of-consciousness feel, especially when he starts having conversations in his head with dead people. The reader spends the entire book inside the head of the protagonist, Vince Parry, and it’s not always a comfortable place. Parry’s wife had been found dead at the bottom of a staircase, with a heavy glass ash-tray covered in his fingerprints lying beside the body. Parry himself believed her death was accidental, but nobody was willing to listen to his side of the story. He manages to break out of gaol, and runs across a strange young woman who seems to know an astonishing amount about his life, and who seems keen to help him. Parry needs all the help he can get, since he finds it difficult to make decisions and really has no idea of what to do next. While he’s trying to decide he finds himself the prime suspect in a second murder, and the plot thickens (as they say). While there’s a mystery at the heart of Dark Passage, a puzzle that needs to be solved, that mystery isn’t really the point of the book. In a sense it doesn’t matter who killed Vince’s wife, or if it was indeed an accident. Goodis is primarily interested in Vince’s struggles to escape the net that is closing around him, and also his struggles with himself over his extremely confused feelings for Irene (the woman who offers to help him). Trusting someone doesn’t come naturally to Parry, and he automatically assumes that he’s not worth it anyway so why should she ruin her life trying to help a loser like him? It’s a gripping and emotionally involving story, and it’s a superbly written book. Goodis has a distinctive style, and it’s a style that becomes almost poetic at times. A number of writers from the hard-boiled or noir school of fiction are now accepted as being not just great crime writers but great writers, and on the strength of this novel Goodis deserves to take his place among them. Most of Clark Ashton Smith’s stories are set in imaginary and fantastic worlds. His Averoigne stories are unusual in that they have a real world setting – medieval France, specifically southern France, the land of the troubadours. Of course it’s a medieval France in which sorcery thrives, and creatures such as vampires and werewolves are commonplace. Some of the Averoigne stories, such as The Colossus of Ylourgne, also come closer to pure horror than almost anything else in Smith’s output. A real world setting doesn’t really suit Smith’s baroque and exotic prose style, although some of these stories do contain hints of other worlds (in fact The Enchantress of Sylaire takes place in a magical realm rather than in Averoigne proper). The stories that are closest to pure horror are I think the least successful, like The Colossus of Ylourgne and A Rendezvous in Averoigne. That’s not to say that they’re bad stories (a Clark Ashton Smith story of the second rank is still a very good story). My favourite of the Averoigne stories is The Enchantress of Sylaire. It’s a delightful story, in fact a kind of love story. The Maker of Gargoyles is another excellent story. Emperor of Dreams, published by Gollancz in the Fantasy Masterworks stories includes many of Clark Ashton Smith’s stories (but be careful if buying online because there’s a biography of Smith with the same title). Others of his stories can be found at the admirable Eldritch Dark website. 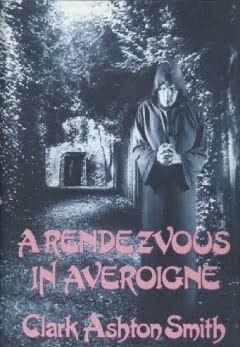 Clark Ashton Smith is close to being my absolute favourite writer, but I don’t really think the Averoigne stories are his best. Personally I much prefer his other story cycles, especially the Zothique cycle, which is I think one of the real glories of fantasy literature. 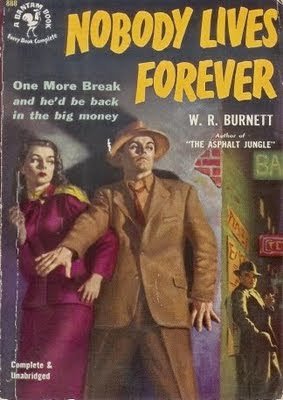 W. R. Burnett is largely forgotten today although he was arguably one of the most influential of American hardboiled crime writers. He achieved success with both his novels (the most famous being Little Caesar and High Sierra) and screenplays. He often adapted his own novels for the screen, a notable example being Nobody Lives Forever (which became an excellent and underrated 1946 film noir). Burnett specialised in moral ambiguity and in anti-heroes. Nobody Lives Forever tell the story of a group of con-men and a particularly ambitious con. Windy, Shake and Doc are losers. They’re con-men without a dime, without hope and lacking even the ambition required for their criminal activities. And they know they’re losers. So when they come across who promises to be a sucker to end all suckers they know the game is out of their league. They’re going to need someone with class. They’re going to need the top guy. The top guy is Jim Farrar, a legend among confidence tricksters. The only problem is, Jim Farrar has decided to retire. He’s haunted by the fear of being a washed-up nobody just like Shake, Windy and Doc. He’s haunted by the fear that he’ll no longer have the polish, the confidence and the looks to be a successful con-artist and will end his days like his own early hero who ended up a drooling derelict. The sucker in question is Mrs Halvorsen, a rich lonely widow reputed to be worth several million dollars. The opportunity is too good to miss. Somehow Jim Farrar has to be persuaded to make one last play. Farrar allows himself to be talked into the scheme but he realise his co-conspirators are useless at best, and a positive liability at worst. He offers the a deal. He is certain he can take Mrs Halvorsen for at least $100,000, so he’ll guarantee Windy, Shake and Doc $10,000 each if they’ll agree to leave matters entirely in his hands. Things don’t work out so simply however. Doc and Jim Farrar have always disliked each other. Doc might be a struck-off medical practitioner with a serious drug habit but he has grandiose ideas about himself and he has always been of the opinion that Jim Farrar has no real class, that the country bumpkin he started life as will always reveal itself. Jim considers Doc to be not merely unstable but potentially a worse problem since Doc is so crazy he is impossible to intimidate. It turns out that both men are absolutely correct about the other’s weaknesses. Jim’s plan was to romance Mrs Halvorsen, then suggest a phony investment scheme, and then take off with the money. There would be no complications. But complications certainly arise when Mrs Halvorsen starts talking about marriage, and Jim finds himself seriously considering the idea. Apart from causing problems with Doc this will also trigger dramas with Jim’s girlfriend Tony. Tony is a no-good dame but Jim is obsessed with her. This is a crime novel that is entirely character-driven. Every character has at least one major weakness that will contribute to the escalating drama. In Jim Farrar’s case the problem is that he’s a lot more emotionally vulnerable than he thought he was. It turns out he’s too nice a guy to be a successful con-man, but he’s too crooked and too selfish to be able to make it in the regular world. 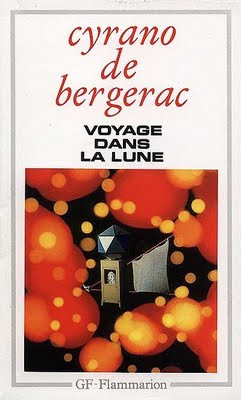 I’m fascinated by very very early science fiction novels and one of the most important of these pioneering works is Cyrano de Bergerac’s Journey to the Moon (or to give it its proper title L'Autre Monde: où les États et Empires de la Lune (The Other World: The States and Empires of the Moon). It was published posthumously in 1657. Cyrano de Bergerac (1619-1655) was an interesting figure in his own right. He was a successful playwright and a notorious duellist. He is said to have fought at least 1,000 duels. And yes, he really did have a very large nose and this was the cause of many of his duels. He was also a homosexual and a religious sceptic who was accused of atheism. And to add to all that he was something of an amateur philosopher and scientific thinker. 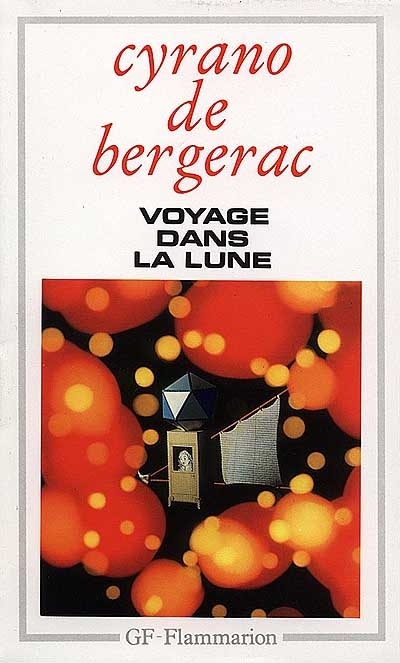 Like most of the early “fantastic voyage” science fiction tales the intention behind Journey to the Moon was largely satirical. What makes this work really interesting though is that this was by no means Cyrano’s only intention. The book is like a blend of whimsical fantasy, satire and hard science fiction. Or at least the 17th century version of hard science fiction. Cyrano’s scientific speculations are an intriguing mix of the medieval and the modern. In this context it’s worth remembering that Cyrano was writing several decades before Newton put physics on a firm scientific basis. While Cyrano has no notion that a lack of breathable air might be an obstacle to a lunar voyage he is aware that the earth’s gravitational field is more powerful than that of the Moon. There’s also some interesting speculation on the nature of reason and on the differences between humans and animals. At times Cyrano almost seems to be moving towards some kind of theory of parallel and divergent evolutionary pathways. As for the plot itself, this is where the whimsy comes in. Dew is certainly an original idea for a fuel for interplanetary travel! The hero uses this means to reach the Moon, where he finds that the inhabitants of our satellite regard the Earth as their moon. They also have some odd customs and ideas on social organisation. They believe in paying respect to youth rather than age. They find it strange when Cyrano tells them that the inhabitants of Earth wear swords as a symbol of honour - on the Moon they regard phalluses in the way 17th century Europeans regarded swords. It’s a very short book and while it’s thin on plot and long on philosophical speculation Cyrano’s speculations are generally entertaining. And it’s a fascinating attempt to imagine a society based on fundamentally different beliefs. If you’re interested in the history of science fiction it’s essential reading. 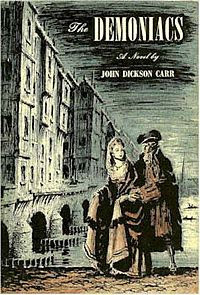 The Demoniacs by John Dickson Carr is an unusual crime novel. The detective is not an amateur sleuth like Miss Marple or Lord Peter Wimsey, nor is he an officer from Scotland Yard. Jeffrey Wynne is a Bow Street Runner, and the year is 1757. The plot revolves around the murder of an old woman, and the mysteries surrounding the parentage of a young man (Wynne) and a young woman. It’s a good detective story in its own right, but it’s the setting that makes it stand out. This is the London of Hogarth and Fielding, a bustling, brawling, bawdy place, full of life but at the same time rank with filth and filled with footpads, pickpockets and prostitutes, and cheap gin joints. Carr brings this city to life. Just as interesting as the story itself are the notes at the back. Many of the characters in the book are real-life people (like the blind Bow Street magistrate John Fielding who controlled the Bow Street Runners), and a parson by the name of Laurence Sterne. Most of the locations were places that really did exist in 18th century London, like the houses on Old London Bridge, Mrs Salmon’s Waxworks, the Ranelagh Pleasure Gardens and Hummums, London’s only Turkish Baths. Most of these places have long since disappeared. An entertaining novel and a vivid glimpse into a period of history that doesn’t get much attention from novelists. Recommended. Jacques Cazotte’s The Devil in Love is one of those books whose historical importance possibly outweighs its intrinsic interest. But it’s still an entertaining read. Don Alvaro is a young Spanish nobleman who dabbles in the occult. He summons a spirit, and gets more than he bargained for. What he gets is Biondetta, a beautiful young woman who claims to be hopelessly in love with him. Biondetta at other times appears as a handsome young page. Don Alvaro can hardy claim that he doesn’t know what he is dealing with, it is clear that Biondetta is not human, but on the other hand she is very charming indeed. She also solves Alvaro’s financial worries by giving him the ability to win unfailingly at games of chance. His heavy gambling losses are soon made good and he amasses a tidy little sum besides. Don Alvaro is cautious about becoming involved with Biondetta, and even more cautious when it becomes obvious that she is determined to get him into bed with her. His reluctance to sleep with her actually has more to do with his Spanish pride than any fear of having sexual relations with a woman who is almost certainly a demon. He is unwilling to compromise his honour by sleeping with a woman before they are married, and he will first need his mother’s approval of the union. Biondetta however is not inclined to give up. And even a Spanish nobleman cannot withstand such a determined siege forever. But can Alvaro succumb to Biondetta’s fleshly charms without risking his immortal soul? The importance of this novel is of course that we are seeing many ideas that would become commonplace in the literature of the fantastique and of the gothic dealt with for the first time in a work of fiction. 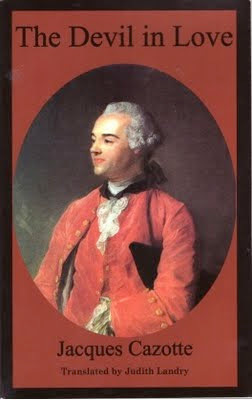 While the themes would be explored in greater depth in later works Cazotte’s treatment is interesting in its own right. Cazotte’s approach to his subject matter is essentially tongue-in-cheek. This is very much an entertainment, a literary bauble created by a witty dilettante. The book was originally intended to be in two parts but only the first part was ever completed. The second part would have changed the nature of the work rather considerably as it was intended to tell the story of Alvaro’s life as a minion of Beelzebub. Cazotte pursued a varied but not especially happy career in the Marine Department of the French Civil Service, his health being badly damaged by overseas postings to the West Indies. He became involved with Catholic mystical groups and his support for the Royalist cause led to his being guillotined in 1792. 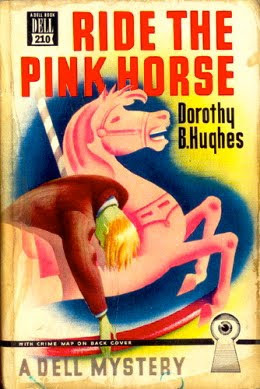 Ride the Pink Horse is rather unusual in being a 1940s hardboiled crime novel written by a woman, Dorothy B. Hughes. Sailor used to work for a crooked senator who operated a combination political machine and crime empire based on Chicago. The senator collected a large life insurance payout after his wife was shot and killed in puzzling circumstances. The police were satisfied at the time, but now they have their suspicions. Sailor knows exactly what happened, and he’s now planning go extract a large amount of blackmail money from the senator, having tracked him to a small town down near the Mexican border where for some mysterious reason the Senator is attending the celebrations of Fiesta. The Chief of Chicago Homicide, Macintyre, also just happens to be in town for Fiesta. Sailor and Mac are old acquaintances, Mac having been Sailor’s first arresting officer back when he was still a kid stealing cars, so there’s a kind of sentimental bond there. Mac has tried many times to set Sailor on the straight and narrow, without success, but he just can’t give up on him. Sailor isn’t evil, but the lure of easy money always wins out. Sailor is like the typical protagonist in film noir, not really a bad guy but weak-willed, a man who just can’t see that he’s heading for disaster on the fast track. The relationships are the key things in this novel. The Sailor-Mac relationship would have been more interesting had Mac not been written as such a dull and moralising kind of guy. He would have been enough to set me off on a life of crime, so I don’t altogether blame Sailor for not listening to him. But the book was published in 1946, and I suspect American readers at that time would have had a much greater tolerance for that kind of sermonising. The love-hate admiration-contempt relationship between Sailor and the Senator is far more intriguing, with a bit of a Freudian undercurrent. Then there’s Sailor’s unlikely friendship with an old Indian, known as Don Jose but christened Pancho Villa by Sailor, who runs the ancient hand-cranked merry-go-round at the Fiesta, and who tries to each Sailor about patience and acceptance. And lastly there’s Pila, a young Indian girl whose odd mix of innocence and a kind of ancient stoicism draws Sailor. There’s no hint of sexual attraction, it’s more that he reminds Sailor of the childhood he never had, being a slum kid with a brutal drunken father. He buys her a ride on the merry-go-round (hence the title). These relationships don’t really go anywhere, but maybe that’s the point. Sailor’s life isn’t going anywhere either, although he thinks he’s on the way to being a big shot. If he could just make a genuine effort to forge a connection with Pancho or Pila, if he could ignore Mac’s tendency to preachiness and accept his help, he could be saved. He hasn’t done anything really bad yet but he has a gun in his pocket and a heart full of anger and hate towards the Senator, a dangerous combination. Ride the Pink Horse was one of several of Hughes’ novels to be made into notable film noirs, the best known being possibly In a Lonely Place. Insofar as he is remembered at all these days, John Buchan is remembered for his spy thrillers like The 39 Steps. He also wrote tales of the supernatural. 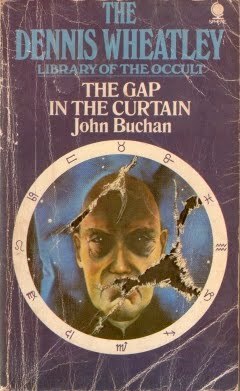 Whether The Gap in the Curtain is a supernatural tale, or science fiction, or horror, is difficult to say. It’s certainly interesting. A brilliant but possibly slightly unbalanced scientist discovers a means of lifting the curtain for a moment and gaining a glimpse of the future. This discovery allows six people to see, for a brief instant of time, a page from a newspaper from one year in the future. The book then follows the life of each of the six people up to that date a year in the future, and examines the way they deal with the knowledge they have gained. The trick to it is that what they each see is an isolated fact, taken out of context. It can enlighten, but it can just as easily mislead. They know one thing that is going to happen, but they don’t know how and why it will happen. The knowledge turns out to be surprisingly dangerous. Several of the participants in the experiment are politicians, who try to use what they’ve found out to advance their careers. One is a financier who hopes to make a killing on the stock market. Others discover more personal information, and are forced to re-evaluate their attitudes towards life and love and death. My copy was published as part of the Dennis Wheatley Library of the Occult back in the 70s, and while it isn’t what you’d expect from an occult thriller or horror story it’s an intriguing book full of odd political speculations and fascinating psychological insights. I’m quite a fan of the French Lemmy Caution movies of the 50s and early 60s. They were based on books written by British crime writer Peter Cheyney. Published in 1946, I’ll Say She Does! was apparently the last of the Lemmy Caution novels. The title character is an American FBI agent whose cases always seemed to take him to Europe. This had the advantage of allowing Cheyney to make his hero a hardboiled American action hero while making use of more familiar European settings. In this novel, set just after the end of the Second World War, Caution is investigating the theft of secret State Department documents. The formula is pretty much the same as in the movies - lots of hardboiled dialogue, intricate and somewhat unlikely plots, lots of double-crosses, a mix of crime and international intrigue, lots of glamorous but no-good dames. Lemmy Caution is a good field agent, but his real passions are for whiskey and dames. Especially glamorous but no-good dames. 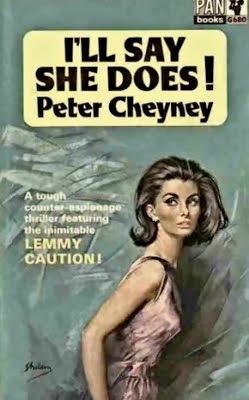 Cheyney’s style is about as pulpy as you can get, but it works well enough assuming that’s the sort of thing you like. Lemmy Caution is a likeable, cheerfully cynical and colourful hero. The pacing is frenetic, and while Cheyney’s prose may lack polish it communicates breathless excitement fairly well. Cheyney was extremely popular during his lifetime (he died in 1951) and the Lemmy Caution books and movies had a huge following in France right up to the 60s, but he’s now faded into obscurity. Which is a pity, because I’ll Say She Does! is pulpy fun. 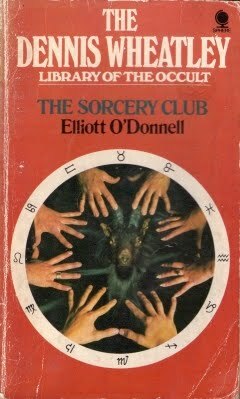 Elliott O’Donnell’s The Sorcery Club, originally published in 1912, was one of the volumes issued in the 70s as part of the Dennis Wheatley Library of the Occult. San Francisco is in the grip of an economic collapse, and three clerks find themselves on the verge of starvation until one of them discovers a strange old book in a junk shop. The book dates back several hundred years, and is an account of the history of the lost civilisation of Atlantis and a practical guide to Atlantean black magic. By means of this tome they make contact with mysterious entities, who offer them a pact – if the three of them can abstain from marriage and from quarrelling with one another for a period of time they will have a succession of powers granted to them and of they hold to this compact for the full period they will have all of those powers for the remainder of their lives. If they break the pact they must however accept the consequences – these consequences being unspecified but presumably somewhat dire. The powers include such desirable things as the ability to understand any kind of puzzle, mind-reading, invisibility, the capacity to inflict disease and the capability of curing all illnesses. Soon they are accumulating considerable wealth, and head off to London in the hope of even richer pickings. They establish the Modern Sorcery Company, initially setting themselves up as conjurers in opposition to England’s greatest exponents of that art, a man named John Martin. Complications naturally arise, involving rivalries for the affections of John Martin’s daughter, and the difficulty these three modern sorcerers have in restraining their own appetites, appetites that they now have the ability to indulge to the full. Wheatley states in his introduction that he had the opportunity of meeting the author, and didn’t care for him overmuch. O’Donnell in fact comes across as a rather unattractive characer so I tend to sympathise with Wheatley on this! The characters are completely lacking in any depth, and the style is at best serviceable. Nonetheless it’s an intriguingly original little novel, with some weird and wonderfully strange occult stuff. The somewhat complex plot relies a bit too heavily on convenient plot devices although it does eventually come to a reasonably satisfactory conclusion. A curiosity piece, but an interesting one, if you can put up with the author’s obsession with the evils of the suffragettes (he seems to view suffragettes as being responsible for just about everything that he thinks is wrong with the world). I'm personally unworried by books that reflect the views of their era so that wasn't a problem for me. I dislike the modern tendency to judge the past by our standards. My copy cost me 50 cents, so I can’t really complain!